When Nashville celebrates, you better believe it's going to be filled with live music and enticing spirits. Earmarked as the bachelorette capital of the country, "Music City USA" sure won't disappoint visitors and locals alike looking for a row of bars to crawl through. 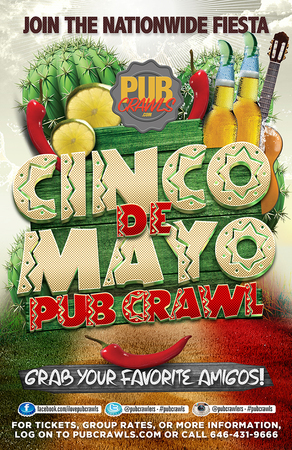 And what better way to start your Cinco de Mayo weekend than to sign up for the #1 Pub Crawl in the country! We at PubCrawls.com strive to bring you the best bars and easiest route to enjoy them. Not to mention, these bars will be slinging your favorite Cinco de Mayo cocktails such as Tequila shots, Margarita's, Corona's, Mojitos and even some authentic Mexican cuisine. Whether your bar hopping or staying at your favorite bar to watch the NHL playoffs in Smashville or meet new party goers in town - it's sure to be an event to remember. On Sunday, May 5th, we guarantee there will be no shortage of live bands, Go Preds chants, sombreros, and fake mustache goers throughout Nashville. Speaking from experience, you should start early and enjoy all of the venues the bar crawl has to offer. Registering for the event is very easy. Simply bring in your ticket after purchasing it or have the email ready on your phone so you can be checked in. Once you're checked in, you will receive a map of all the bars including their hours and drink specials. Next, you will receive a yellow PubCrawls.com branded wristband so that all the venues staff can identify you as part of the crawl, grant you entry and all applicable discounts. We have said enough and now it's time for you to experience a little taste of Nashville by joining us this Cinco de Mayo for an event you don't want to miss.